Hear Christian O’Connell talking about Radio Boy on Fun Kids! Christian's been chatting to Sean from Fun Kids about his first book! 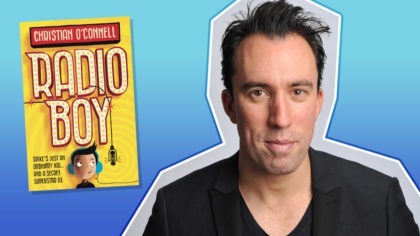 Radio star Christian O’Connell has written his first book for kids – called Radio Boy! It’s about Spike (a.k.a. Radio Boy) who starts a secret radio show from his garden shed! But when Spike goes too far and mocks his headmaster, a hunt is launched for the mysterious Radio Boy… can he remain anonymous? Click the play button at the top of the page to hear Christian chatting to Sean about the book! Listen to Sean on the Fun Kids Breakfast Show weekdays when you wake up! Sean (and his co-host Robot) have got amazing tunes, LOLs and competitions!